I am sorry I have been absent all weekend but I spent it freelancing for the fabulous fashion house Chanel, doing a makeup event at Nordstrom. I will be doing a review on some of the products this week because that is truly one fabulous line and I am sad that I have decided to hang up my brush belt indefinitely. I enjoyed all of the new people that I met while there and seeing some of my old makeup buddies as well. But upward and onward. 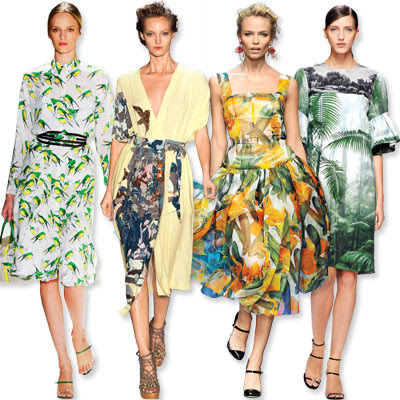 Today's trend is called "Scenes in Nature" and it first started with the retro Fruit Prints in last year's S/S 2011 Runway shows. And since it is on its second turn, the price points are more reasonable for us girls on a budget. 1 comment on "S/S 2012 Trend, Scenes in Nature"